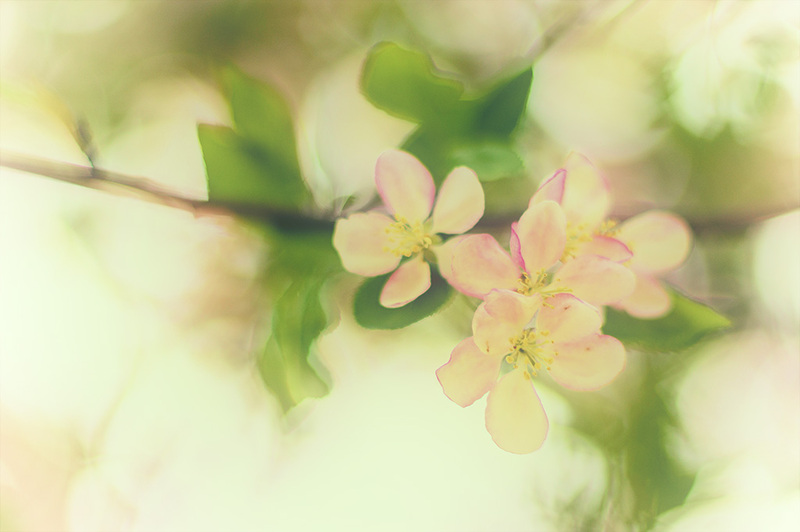 Yes, I am still in my spring blossom shooting mode. It happens every year for a week or two, then I’m done. After this week I’ll go back to shooting buildings and such, trying to find abstracts, and chasing the light and looking the other way. After yet another bout of weekend illness (flu, fever, cold, whatever you want to call it) I was out and about again today and managed to take a few moments to do some shooting. I really wanted to experiment with some compositions instead of simply shooting blossoms head on but the wind wouldn’t hear of it. The gusts were persistent and all I could hope to do was focus and shoot as fast as I could before my subject blew out of the frame. Not a good thing when you’re trying to do narrow depth-of-field (bokeh, if you must) shooting. I guess I could have done the traditional tripod mounted, slow shutter shot of blurred blossoms on a still trunk thing but there wasn’t a photogenic background worth capturing in the local, not so pretty, park, so I had to work close. After I sort through my shots I may post another pic or two but that will probably be the end of the fun little flowers. Enough pretty stuff!